What Makes Water Tanks Collapse? Implosion is a process in which objects are destroyed by collapsing (or being squeezed in) on themselves. The opposite of explosion, implosion concentrates matter and energy. True implosion usually involves a difference between internal (lower) and external (higher) pressure, or inward and outward forces, that is so large that the structure collapses inward into itself. An example of implosion is a submarine being crushed from the outside by the hydrostatic pressure of the surrounding water. That’s what happened to the reverse osmosis tank pictured above. The tank, which at 24″ X 57″, is larger than it appears in the picture, is an 80-gallon “fiberglass” reverse osmosis tank. 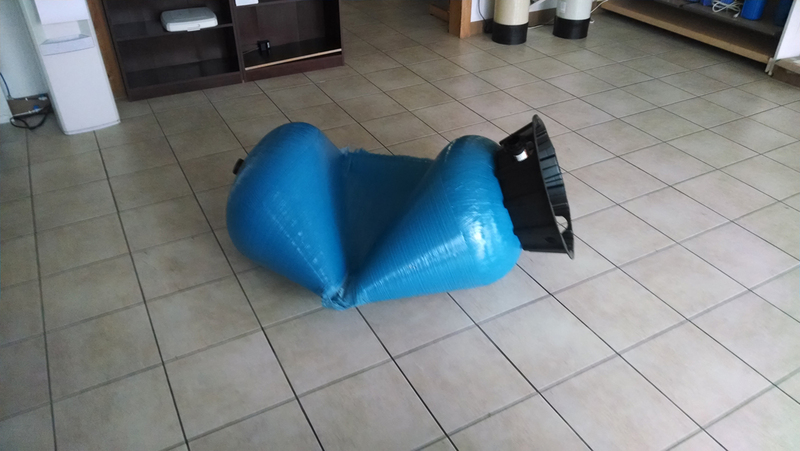 It imploded while in service in an office building in Ft. Worth, TX. The force of the implosion was so strong that the tank slammed against a wall and knocked a hole in the siding. Familiar water treatment tanks, including “mineral tanks” (the tanks that backwashing filters are made with), retention tanks, and well and reverse osmosis tanks, are usually called “fiberglass” tanks although they are actually composed of many plastic materials materials. These are at risk of implosion. That is because they are made to be very strong from the inside out so that they can withstand high water pressure, but they are not constructed to be strong from the outside in. Only minimal pressure caused by the development of a vacuum inside the tank can cause them to implode. Fiberglass tank makers always exclude implosion from their warranties. The tank above shows why. Although the tank is large, it collapsed because of vacuum created by a small delivery pump. Tank manufacturers also recommend installation with a vacuum breaker to prevent implosions. The tank in the picture was installed without a vacuum breaker. 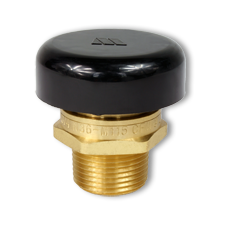 A vacuum breaker is a simple plumbing device that has a small plastic disk held in place by water pressure. When the pressure goes away, the disk falls and allows air to enter the pipe, breaking the vacuum and preventing backflow due to siphoning and implosion cause by atmospheric pressure.